A pair of prescription glasses was found a couple of weeks ago on one of the district school buses. If your child has lost a pair of prescription glasses, please email a description of the lost glasses to joey.ward@smackover.net . Posted in Buckaroo News on April 30, 2015 by The Buckaroo Blog. We will update game cancellations and rescheduled times as well as other important information regarding our school district on the blog. Enter your email address in the section entitled Follow Blog via Email to receive notification of new posts to the blog. Posted in Buckaroo News on April 29, 2015 by The Buckaroo Blog. The Smackover-Norphlet School District is in the process of determining community interest in a paid preschool program on the Norphlet campus. The program could potentially serve infants, toddlers, and 3-4 year old children. The program would be run by the Smackover-Norphlet School District and would meet all DHS licensing requirements. Please complete the form below if you would be interested in your child participating in the proposed Norphlet Preschool program. Please return forms to the Norphlet Elementary School office or the Smackover-Norphlet School District Central Office. The deadline for submitting the interest form is Tuesday, May 5, 2015. Posted in Buckaroo News on April 28, 2015 by The Buckaroo Blog. The School Choice deadline for the 2015-2016 school year has been moved up to May 1, 2015. 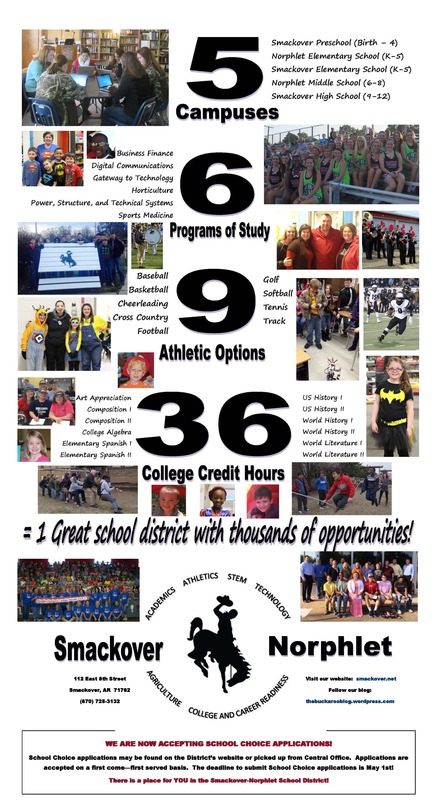 The School Choice application can be found here. Act 560 of 2015 amended Ark. Code Ann. § 6-18-1901 et seq. The act went into effect on March 20, 2015. The act sets the new application deadline at May 1, 2015. The following school districts provided the Arkansas Department of Education with notice that the school districts have conflicts with the Public School Choice Act of 2015 due to active desegregation orders or active court-approved desegregation plans. Click on the name of the school district to review the documentation provided by each school district. Congratulations to the following Smackover High School and Smackover Elementary School students who placed in the Region Solo and Ensemble Assessment on April 17th. Posted in Buckaroo News on April 27, 2015 by The Buckaroo Blog. Arkansas Children’s Week was April 13-17, 2015. The Smackover Preschool students participated in a parade in downtown Smackover on Tuesday of that week. Posted in Buckaroo News on April 24, 2015 by The Buckaroo Blog. Smackover Shooting Sports competed at the Camden tournament on Saturday April 11th. Posted in Buckaroo News on April 23, 2015 by The Buckaroo Blog.